Building on the success of the Phase 1 pilot, Action Against Hunger is working with the Government of Mali to define which is the best level of training of supervision that CHWs need to scale up the intervention, with the same quality of care of SAM treatment. The study is being carried out in the Kayes region in three districts, Kayes, Kita and Bafoulabé, working at 115 health facilities and with 164 CHWs. additional treatment time of SAM by CHWs, and the effect on other treatment of other diseases in the iCCM package. The C-Project Phase 2 study is still ongoing. 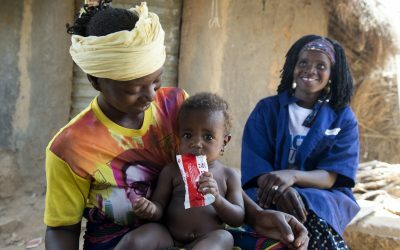 So far, the study has measured the baseline coverage in the regions participating, trained 164 CHWs in acute malnutrition and the standard iCCM package (the management of diarrhoea, malaria, pneumonia, family planning and hygiene promotion), and admitted a total of 542 children with SAM to the study. Final results are expected by the end of 2018. Expected Impact: The C-Project is an example of Action Against Hunger’s work to test new operational models that will increase access to critical health and nutrition services. In order to generate the evidence needed to influence programmes delivered at scale, a multi-phased approach was used to first pilot the idea and then to further refine it and build the operational evidence to inform delivery at scale by the Government of Mali.